Pope Francis made an apostolic and state visit to the Philippines from January 15 to 19, 2015. He was the third pontiff to visit my country, after Pope Paul VI and Pope John Paul II. His visit came two years after the devastating Typhoon Haiyan took the lives of more than 6,300 Filipinos. He was a ray of hope not just to the survivors and their families, but also to the 80 million Filipino Catholics. Between six to seven million people attended the mass he officiated on January 18, 2015, at Rizal Park in Manila —a record for a papal event, according to Philippine and Vatican officials. And we Filipinos gave him an endearing nickname: Lolo Kiko (literally, ‘Grandpa Francis’). My fortuitous encounter with the Pope happened on January 16. It was a Friday and I was doing my usual work as a staff photographer for then Philippine President Benigno Aquino III. Pope Francis, who is also the sovereign head of the Vatican City State, made a courtesy call to President Aquino at Malacañang Palace. The atmosphere at the palace was electrifying to say the least. The red carpet was laid a day before and everyone came in his/her best Sunday outfits or Philippine national attires. Working at the seat of government, we were used to official protocols. But our visitor that day was not the leader of a worldly domain. It was a big break from the daily tension running in the country; we were all in high spirits. 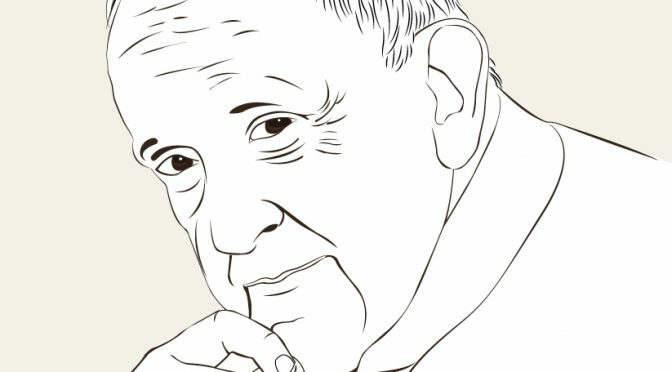 My colleagues and I said: “If he [Pope Francis] passed by and looked at us, we would be so elated.” No words can explain our feeling — we really love the Pope. I was also excited about the prospect of seeing Pope Francis in person. Even before he entered the palace grounds, people erupted in cheers, chanting “Viva El Papa!” and “Lolo Kiko, we love you!” President Aquino welcomed the Pope in Malacañang and, as a close-in photographer, I was merely five feet away from him. Like any other photographer, I was jostling to get a better angle to take photos of the Pope. But deep inside, at that very moment, I felt I was away from all the chaos of daily life. No wonder why people, and not just Catholics, admire the Pope. This man, who is also respected as Prince of the Church, has been known for his humility, dedication to help the poor and dispossessed, protecting the environment, commitment to interfaith dialogue and emphasis on God’s love and mercy. Despite so much power entrusted to him, he was actually one of the humblest people I have ever seen. He has a very warm persona: his voice was calm, yet firm; he showed genuine concern for everyone. After the ceremonial honours at the Kalayaan Grounds, he was ushered inside Malacañang. Some photographers went ahead to get the best position in the Rizal Ceremonial Hall, where senior Philippine officials and members of the diplomatic corps were also in attendance. But I chose to stay close with the Pope. While Pope Francis was at the holding room, some staff at Malacañang saw the opportunity to kiss his hand. There was no security issue as we knew each and everyone and I became the designated photographer. Then it was my turn to kiss the hand of the Pope. Everything had to happen fast lest I missed that opportunity. I was holding two cameras — and I did not ask any of my colleagues to take them or snap a photo of me with the Pope. I put one camera on my shoulder and held the other with my left hand while I extended my right hand to the Pope. He took my hand and looked me directly in the eye with a very fatherly gaze. Then I bowed and kissed his hand. I could not describe my feeling at that very moment. The rapture of joy and bliss was mixed with a sense of achievement. What I could say was at that very instant I was also uttering a fervent prayer to God. My job in Malacañang would be over after the president’s term in office ends in a year’s time. I applied for a job at Khaleej Times and I prayed that I would get it. And talk about going full circle: I’m slated to cover Pope Francis’ visit in Abu Dhabi next week as part of the KT team. After taking photos of Pope Francis and President Aquino during their speech, I immediately and excitedly shared the news with my wife — that I was able to kiss the hand of the Pope. I can’t remember what else she said but she gave me a warm embrace.